Missed Deadlines? Forgotten Comments? Lost Email Chains? There's a Better Way! Manage change and develop internal documents on our proven, easy-to-use platform. 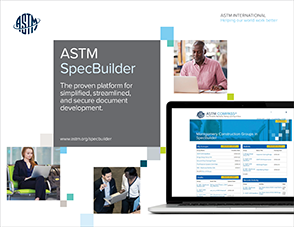 After 100+ years of refinements, ASTM's world-renowned process for creating and maintaining technical documents is now available to you. Access a comprehensive archive at anytime.